HOW CAN I CALL AN AMBULANCE IN MALAYSIA? Yes, you can reportedly call 999 from anywhere, but it’s important to know local hospital numbers to call just in case. Please note: The numbers listed here are are largely for private ambulance services providing inter-facility transports, not focused on providing prehospital emergency care. However, Lin et al (2016) report that there is an “Absence of standardization on the education requirements for EMS providers”. 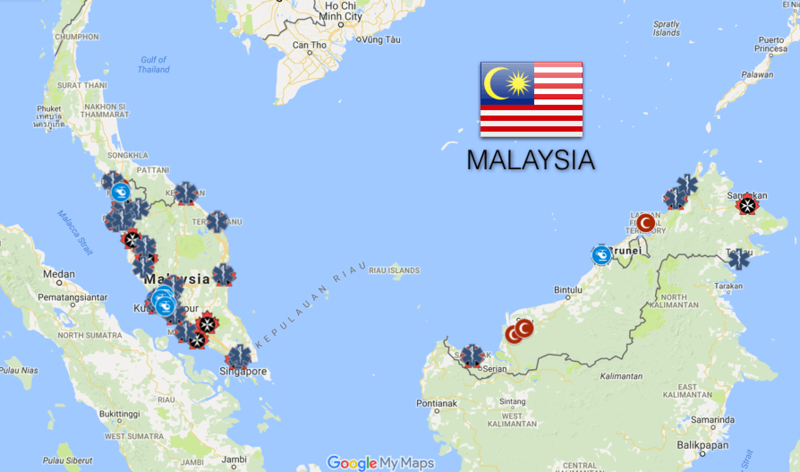 “In 2010, there were 223 hospitals in Malaysia that provided emergency and trauma services, of which 133 were public hospitals and 90 private hospitals.” (Arunah, 2010) See the full list here. Anisah A et al: “Patients’ perception of the ambulance services at Hospital Universiti Sains Malaysia.” Singapore Medical Journal 2008;49(8):631-5. Cheng SK et al: “Cardiopulmonary Resuscitation : The Short Comings in Malaysia.” Malaysian Journal of Medical Sciences. 2008;15(1):49–51. Hausmann M et al: “Designing a prehospital system for a developing country: estimated cost and benefits.” American Journal of Emergency Medicine. 1997 Oct;15(6):600-3. Hisamuddin N, Hamzah MS, Holliman CJ: “Prehospital emergency medical services in Malaysia.” Journal of Emergency Medicine 2007;32(4):415-21. Lin CH et al: “Variation of current protocols for managing out-of-hospital cardiac arrest in prehospital settings among Asian countries.” Journal of the Formosan Medical Association 2016 Aug;115(8):628-38. National Healthcare Establishments and Workforce Statistics 2010, Government of Malaysia. Chapter 6: “Emergency and Trauma Services in Malaysian Hospitals.” Editor: Arunah C et al. Rahman NH: “Emergency medical services key performance measurement in Asian cities.” International Journal of Emergency Medicine. 2015 Apr 23;8:12. Shah Che Hamzah MS et al:”Ambulance services at hospital universiti sains malaysia and hospital kota bharu: a retrospective study of calls.” Malaysian Journal of Medical Sciences 2005;12(2):34-42. Thank you, Anson — you are correct. We will make a note that these alternative numbers are for scheduled ambulance transports. Technically, the patient may have a medical emergency, but you are correct that they are not prehospital emergency services. Thank you for pointing that out.